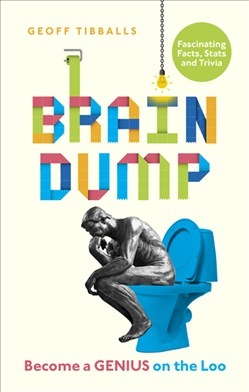 If there is one other paper-based product you will want to keep close at hand in the loo it is Brain Dump. Discover thousands of fun facts and stats, quirky lists, trivia and other things you need to know in the time it takes you to do a poo. Guaranteed to boost your brain while the rest of your body is otherwise occupied, this bumper compendium covers every subject from football to phobias, mountains to the Muppets and spiders to Shakespeare. It features hundreds of mind-blowing entries including Famous Haemorrhoid Sufferers, People Who Narrowly Missed Boarding The Titanic, Types of Cloud, Dentists in Films, Longest Song Titles, Awesome Australian Slang Words, and Fascinating Facts About Sheep. Printed on soft absorbent paper for emergencies. Acquista Brain Dump in Epub: dopo aver letto l’ebook Brain Dump di Geoff Tibballs ti invitiamo a lasciarci una Recensione qui sotto: sarà utile agli utenti che non abbiano ancora letto questo libro e che vogliano avere delle opinioni altrui. L’opinione su di un libro è molto soggettiva e per questo leggere eventuali recensioni negative non ci dovrà frenare dall’acquisto, anzi dovrà spingerci ad acquistare il libro in fretta per poter dire la nostra ed eventualmente smentire quanto commentato da altri, contribuendo ad arricchire più possibile i commenti e dare sempre più spunti di confronto al pubblico online.